This cake was my sister Jessica’s wedding cake. It was a three tiered vanilla cake with strawberry filling. All cakes were covered in white buttercream icing. 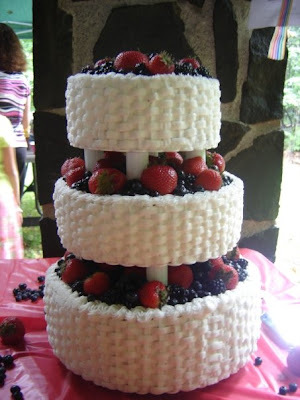 The cakes were decorated with a traditional basketweave on the sides. Edges were decorated with rope detailing. Then each cake was topped with fresh strawberries, blueberries and blackberries.